Hard to believe, but Frank Capra's It's a Wonderful Life wasn't always revered as a classic. Upon its initial release, critics called it â€œmincingâ€� and â€œa figment of Pollyanna platitudes.â€� The film was, however, popular enough to give rise to a series of radio adaptations, some with Jimmy Stewart and Donna Reed reprising their now-beloved roles as George and Mary Bailey. This is the tradition to which Joe Landryâ€™s Itâ€™s a Wonderful Life: A Live Radio Play harkens back. While annual television screenings of the 1946 film evoke nostalgia for the golden age of Hollywood, Landry's play does the same for the golden age of radio. 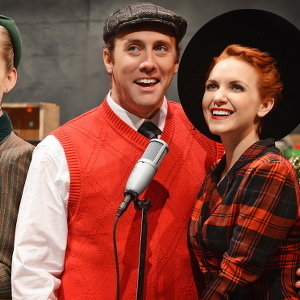 The production at San Jose Stage Company, directed by Randall King, both looks and sounds like a 1940s radio broadcast. The set of â€œWBFRâ€� comes complete with microphones, light-up applause signals and Kevin Blackton, who certainly has a voice for radio, playing host Freddie Filmore. There are even commercial breaks with jingles for hair tonic and toilet cakes.